MCBs are used to protect plants, buildings and for industrial applications. The devices can be used as main switches for the disconnection or isolation of plants. For industrial applications and in plant engineering, miniature circuit breakers can be supplemented with additional components, such as auxiliary switches, fault signal contacts, shunt trips, under voltage releases, remote controlled mechanisms and RC units. The devices are approved for worldwide use according to IEC standards for systems up to 250/440 V AC. 60 V DC per pole is permitted in DC systems. The in feed can be either from the top or the bottom as the terminals are identical. Clear and visible conductor connection in front of the busbars that can be easily checked. Large and easily accessible wiring space enables easy insertion of conductor in the terminal. Integrated movable terminal covers located at the cable entries ensure the terminals are fully insulated when the screws are tightened. 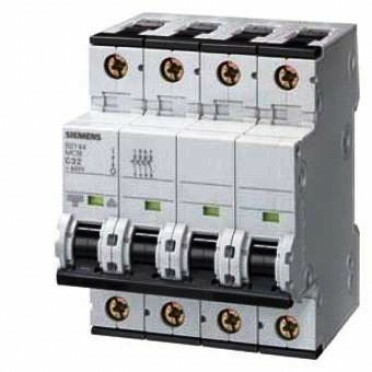 Features & Specifications :Make : SiemensRated current - 40A to 160A, 3 and 4 pole versionsBreak..